Using a version of theme that supports section, will help you update theme automatically. You can purchase Pixel Union Shopify theme, it will provide you a lifetime free updated version of that theme. There are still many versions of theme that does not support sections; you will have to update them manually. 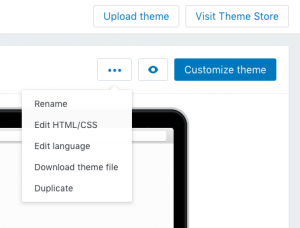 The following process will help you theme to a new version without hampering your current customizations and settings. How to duplicate your old/published theme? Now, open the duplicate and click the “…” button. Then click on Edit HTML/CSS. You can keep this window open for later reference. If the theme has been bought from the Shopify store, then you can download an updated version for free from the Shopify theme store. Search for your theme and then click on Buy Theme. Note: You are using the same Shopify account with which you have purchased your first theme. You will find the theme added in the Theme page of your Shopify admin. If the theme has been bought from the pixelunion.net, then you need to send an email to support@pixelunion.net and you will receive a theme file (.zip) to upload. You will find an unpublished theme on the Theme page of your dashboard. You will now need to move the custom code from your Liquid file. You will find the custom code documented, incase, you do not find it, you can use the file comparison tool Diffchecker. The missing code will be highlighted in red in the Original text field. You will need to reinstall the App that add code to your theme’s file. Installation instructions in the app documentation or you can go to Apps and click View Details to find the instructions. Once you are done with the above steps, click Publish on the new version of the Theme.